Knit, Knit, Knit, and Knit Some More! | Knitting. Just knitting. Knit, Knit, Knit, and Knit Some More! MCY was doing great for a while, then for whatever reason, people received their packages way later than they should have (months), didn’t receive their packages at all, received yarn that was not even close to what was advertised, or the yarn bled (in one case, it bled enough to dye three other skeins of yarn! When the complaints started pouring in, MCY let customers know that Danielle Glunt, owner and operator of MCY has been suffering with leukemia. People reported seeing her, doing just fine, after this announcement was made, while Danielle was supposedly in the hospital. Shortly after this, an email was sent out from a supposed family member, stating that Danielle had died and they were wanting to sell the leftover yarn to pay their creditors. Danielle has since answered phone calls, been seen in public, and thus is either a zombie or still very much alive. I’m voting for very much alive. Despite this, only two people that I can remember offhand have been refunded money since Danielle died, out of many who are owed money. Because of this scandal, though I have never purchased MCY yarn, I am putting together something detailing what exactly has happened, a timeline of events, as well as trying to inform people of how to contact the New Mexico Attorney General to try and receive a refund. If you feel you have been scammed by Danielle, please send me an email at FlaKnitter AT gmail DOT com, and let me know what has happened. I will forward to you the address for the NM AG, as well as a form you can easily fill out to clearly and concisely complain to the AG. Right now, people are sending their complaints to the NM AG, and an IC3 investigation has been started. Any questions or comments, please feel free to email me. Disclaimer: I am not affiliated in any way with MCY, and have never been a customer. I am simply trying to organize the facts to get them out easily to the public. Also, I am not a lawyer and cannot give any legal advice. All I can do is try and point you in the right direction. Please refer to a lawyer if you need more advice/legal advice. Thanks for understanding! I killed my Icarus shawl. 😦 Never, ever, ever leave your bamboo needles where they could get sat on and broken! But, it’s restarted, and I have gotten about half of the first repeat of chart 1 done. Since I’ve got Monday off, I’m hoping to catch up with everyone! I also went on a yarn crawl yesterday with Peggy and Diane. So much fun!!! We started at Fay’s (where I must go Monday to get some yarn for a hat…Peggy convinced me! ), then to Really Knit Stuff, where I got 2 skeins of Cherry Tree Hill in turquoise and the pattern for the BSJ. Last, we went to Wooly Bully, where they were doing a weaving class. So interesting to watch, but I don’t need another hobby!! 🙂 Didn’t buy anything there, but plan on it when that dreaded paycheck comes in!! I also found out about a Friday knit night at RKS, so I will be going to that after my knit night at Wooly Bully I think, I love meeting people and knitting, so it should be great fun!! I figured out the pictures thingy, so let’s take a loot at my Christmas knitting, shall we? It’s for by the keyboard, and there’s a smaller one for by the mouse. It’s a sunset-inspired version of Sophie, and was made with yarn I hand dyed. Yup. Knitted police tape. Unfortunately, I’m not quite done yet, so I’m going to have to mail it to him. But, I found a book on forensics involving motor vehicles (or something like that) for free at my library, so I picked that up for him. Okay, well, last week I was at my boyfriends house. I decided to be daring and try that laceweight that I’ve been scared of touching for like a month now. Maybe two months… Anyways, the pattern I was doing wanted you to CO so many sts and k five rows garter st. So, I did that. Row 3 was off. So I ripped. Row 2 was off, so I ripped. Row 5 was off by like 7 sts, so I ripped again and had a beer. I tried a few more times, put the knitting aside, and swore off lace weight forever. So what did I do tonight? Oh yeah, I CO for the Icarus Shawl from interweave knits. (Scroll way down). Yup, it’s laceweight. And charted. I’ve never doe charts before. **sighs** All because a few other people from my knitting group are doing it. I’m such a copy-cat! Well, at least it’s going good so far. Actually, it’s going great and I’m getting a little confident….that’s not a good sign. Hopefully the knitting goddess is working with someone else this whole project and just skips over me, but I’m not too sure that’s going to happen. **sigh** At least I’m over my fright! My mom got a felted purse, which I hand-dyed the colors for. I can’d find blue kool-aid here, so she got red/yellow/orange. I was hoping it would look like the sunset and be something she takes with her to Hawaii… I’m not completely satisfied with how the handles turned out (I’ll make them thicker if I do it again), but otherwise it was a really quick knit–I pretty much got it done Christmas Eve and a little Christmas morning. My dad got the thingies that you put by the keyboard and mouse to help hold your wrists at the proper place. He had no idea what they were when he opened the package! LOL, but I think he likes them. They’re in the computer room at least. And, he doesn’t know it, but I’m working on a tie for him. My brother is getting a scarf. Yes, is getting. He’s seen it halfway done and likes it, but I way underestimated the time it would take to make it (my first stranding project, yay!). It’s gonna be so cool when it’s done! He’s gonna be a cop, right? So what better gift from his dear sister than a scarf made to look like crime scene tape? Don’t answer. I liked the idea! ETA Sorry, pics aren’t working. 😦 Gonna have to work on that! Okay, so it’s not like I don’t have anything to knit. I do. Plenty. 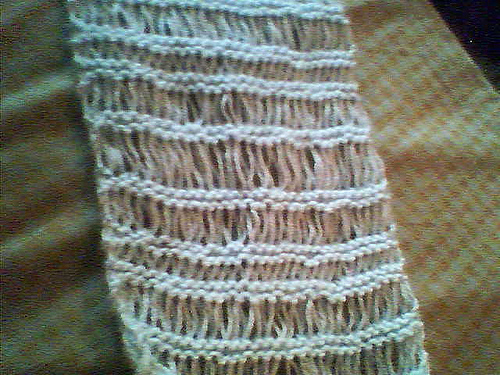 I’ve got about 4,000,000 dishcloths for my mom (well, maybe not that many, but close), a spa set for school (due Tuesday) for our White Elephant thingy, a scarf for my bro (knitted police tape, since he’s gonna be a cop), a wallet for my dad (since he doesn’t need ties anymore…), a bathmat for my mom, a blanket for my bf (in all fairness, it should only have like an hour of knitting left…), an quant for me (from Knitty.com), something (anything) out of the skein of Noro Silk Garden I bought today, a couple of pair of wristwarmers (for me and mom), the rest of the clapotis, and the rest of the sock from my last pattern. Oh, and socks for me and mom. On the other side of things, I’ll have 3 or 4 days dedicated to knitting, 3 half days at work where I can get some done, and nights now that schools over. Unfortunately I can’t knit in Child Development anymore since I’m done with it…. Ah well, I’m going to go work on the spa set and watch some TV. Or maybe the socks. The blanket? Ah, whatever. I’ll work on something. WARNING: This has NOT been test knit. If you knit it, please let me know if you come across any problems. Mine was knitted with LionBrand Wool (worsted weight), Hand-Dyed to my puppy’s favorite color. I used size 3ndls, but you don’t usually have to go that far in size to get a tight fabric–they were the only size I had free! Written for knitting in the round, but can work for DPNs, two circs, or MLing. I used DPNs because that’s what I have and prefer, but feel free to use another circular knitting method of your choice! 1)Measure the widest part of the dog’s foot (the ball of the foot, basically). 2)Knit a gauge swatch in the yarn and needles you want to use. (Use a needle a couple of sizes smaller than you usually would to create a tight fabric to help prevent nails sticking through). 3)Determine your gauge, and multiply the gauge per inch by the inches around the dog’s foot is. 4)Fudge a little to get a number divisible by 4. 5)Cast on this number of sts, and join in the round. 3)See above, divided to get sts/in which was 7.5, multiplied 7.5 by 4.25 to get 31.875. K 3 rnds in 2×2 rib. K until about 3/4″ from desired length. decrease by SSK the second and third sts on each needle). Decrease until half the # of CO sts are left (may have to add extra decrease in last decrease round). eyelets at top and tie on! me on Ravelry (FlaKnitter). Enjoy!! I’m linked! Yay! My design has now been linked to my Ravelry profile, so if you’re on ravelry, you can find it by looking for me– FlaKnitter! Cool stuff! I’ve got a couple more patterns I’m working on writing, so we’ll see how that works. I’m thinking about a stuffed animal that uses double knitting, what do you think?? Oh! And I’m working on getting my thingy that Casey is letting me test up here–I’ll be working on that tonight. It’s not supposed to work on wordpress, but I’m going to see if there is anything that I CAN do about it! Other than move, but I will if I must…. I’ll keep you posted! Not dead yet, just busy! Materials/Guage: Doesn’t really matter. Pick a yarn and needles, do a swatch with it, and figure out your sts/in. Multiply by the # of inches wide you want the scarf, and cast on that number. CO required # for your yarn and width. Row 6: K across, dropping all YOs. Row 10: K across, dropping all YOs. Row 14: K across, dropping all YOs. Row 18: K across, dropping all YOs. Repeat rows 5 through 20, pulling after the K rows to pull down the YOs. They’ll stretch a LOT by doing this, and that’ s what you want. End by K across an extra 2 rows, and bind off. I found a pattern I liked for my mom’s scarf, but….okay, well I didn’t really like it…I’ve been having trouble with that lately. No one seems to be writing patterns for exactly what I want. So, I came up with my own! And I’ve been busy frogging and knitting and frogging and knitting all day, but I think I’ve finally got it now…going to knit again!